The Summit of Gore Mountain from the trail “Uncas”. Photo by Ian Taylor Iant333. 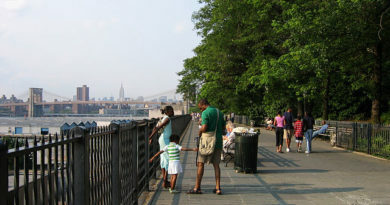 People in Brooklyn, don’t despair! In only four hours of less of driving you can be swooshing down some wonderful ski runs, without having to break the bank on airfare, or spending any more of your limited, precious time on the extreme hassle of flying. Check out these five great destinations and get your powder-white fix this winter, with minimum bother. • Only one hour and 45 minutes away, Mount Peter Ski Area is one of the few family-owned ski resorts left in New York State, and the oldest extant ski area, too. At 400 feet-high, the peak is covered with five ski lifts and 14 runs equally divided between advanced, intermediate and beginner. The resort, just north of the New Jersey-New York border, offers free beginner ski and snowboarding school. 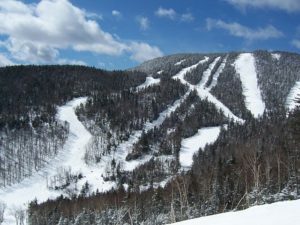 • Thunder Ridge Ski Area is even closer to Brooklyn than Mount Peter- only one hour and 30 minutes away, in Patterson. The 22 trails, accessible by 6 lifts, are geared to intermediate and beginner skiers. The resort has the capability of covering 95 percent of the mountain with artificial snow, so even if the snowfall was minimal, there is still great skiing to be had. • Catamount Ski Area is found on the border between New York and Massachusetts in the Taconic Mountains. With seven lifts and 36 trails in 119 acres, it is one of the largest ski areas in New York or New England. It is only two hours and 45 minutes-drive from Brooklyn. • If night-skiing is your thing, you will love Windham Mountain Resort. With a 1,600-foot-high incline and 52 ski trails with 12 lifts, this resort is well worth the trip. To top it off, there is an on-site spa, five terrain parks for freestylers, and artificial snow. Located in Windham, New York, it takes only 3 hours to get there from Brooklyn. • Looking for a ski area a little further away? Give the Royal Mountain Ski Area a try. It is a three-hour and 45-minute drive from Brooklyn, and when you get there you will find 30 acres of great skiing with a 550-foot vertical drop, three lifts and 14 ski runs, equally divided between beginners, intermediate and advanced.